If you’re just joining us, be sure to read part 1 of Amber Coppings’ teaching artist series to learn more about Amber and her time at POWER House. 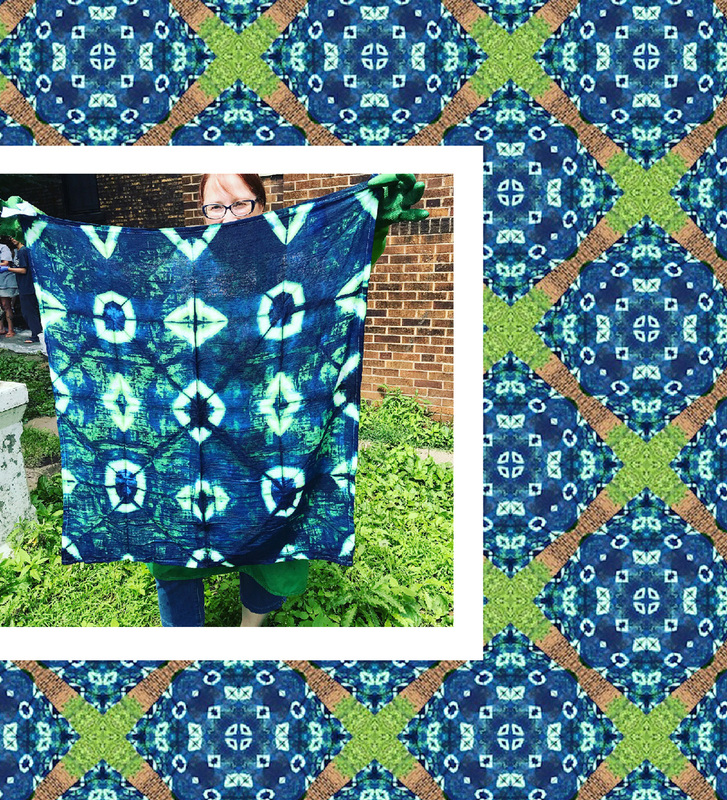 Amber: Thanks to a sponsorship from Spoonflower, the women in the POWER House in the summer of 2018 were able to study surface pattern design processes and create pillows made with their own patterned fabrics! 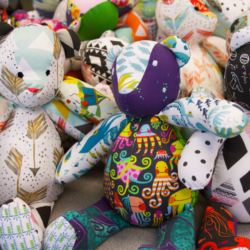 Read on for an insider view into our surface pattern design class sessions. 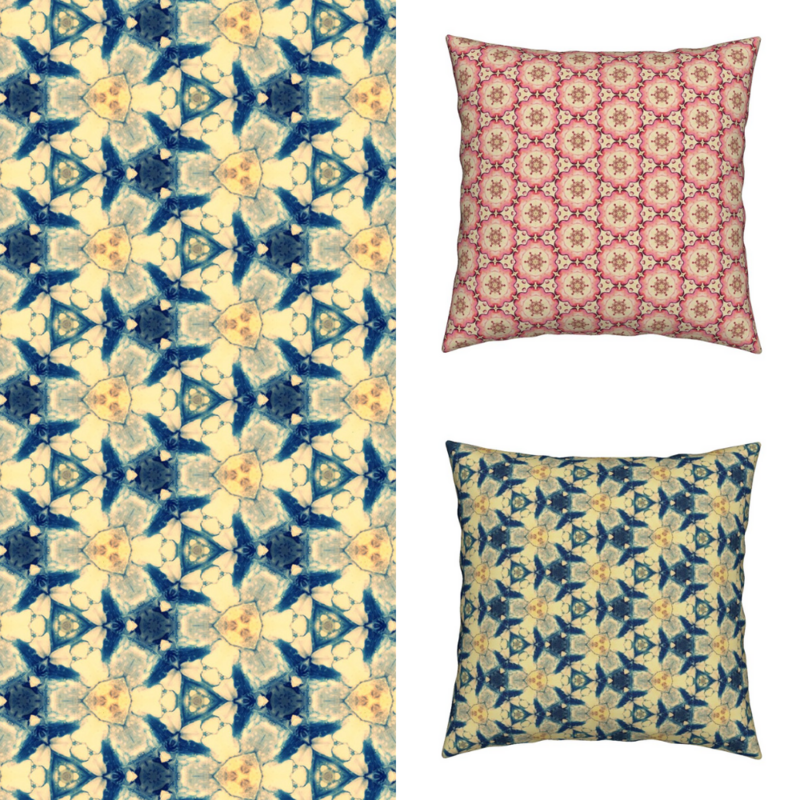 Surface Pattern Design is a perfect way to combine art, design, and craft. As a teaching artist, I think some of my most successful projects blend these modalities together. We can be self-expressive, use design principles to hone our work, and then create a functional item out of the results. Since we divide the year into 3-4 sections that have different projects and artistic goals, I thought at least one section in 2018 should be focused on surface pattern design. Thanks to Spoonflower, we were able to print our designs! The goal was not necessarily to create a cohesive collection, but instead to have each POWER woman develop skills over a period of time, then make her own artistic choices as to how her design would look. Having said that, I started the summer session the same way I have started every session – by focusing on the simplest art element, Line. As one participant said in my very first class (within an hour of telling me she couldn’t draw), “I didn’t know lines could do so many things!” Using lines to communicate ideas, emotions, objects, or just as a meditation, can be very freeing, especially for those who feel insecure about their art skills. 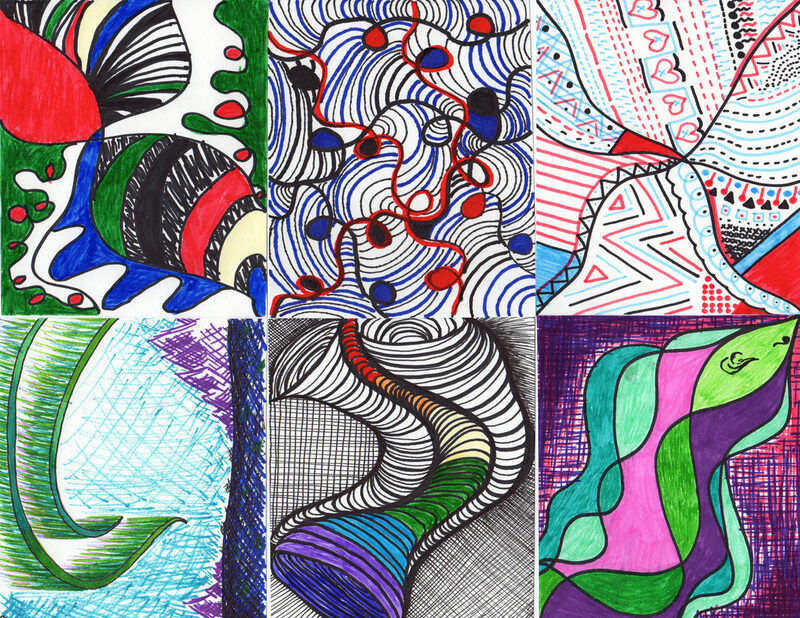 Line drawings from the Power House women. From drawing, we quickly moved into adding color with markers and paint, then making stamps to explore repeated patterns. All of this was documented in sketchbooks that the women could store in the common area, or take to their rooms to use. 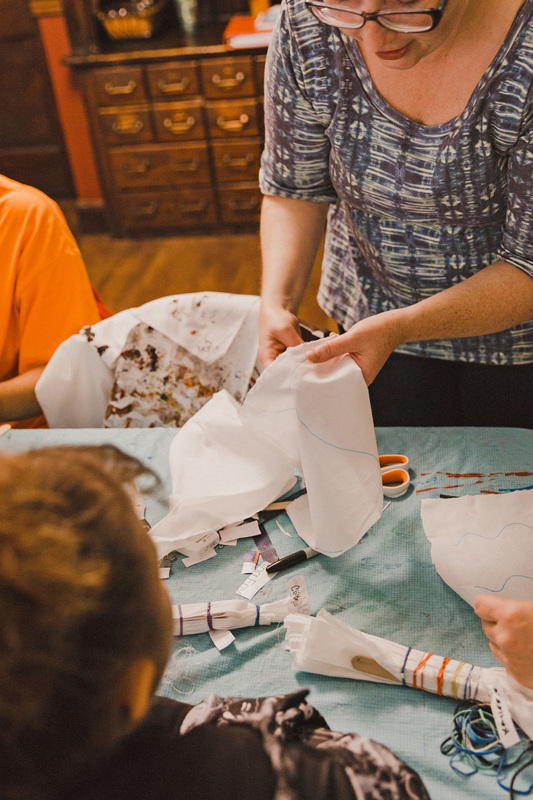 The women built up their creative muscles over a month’s worth of art sessions and started to relax into the process of learning and making art. 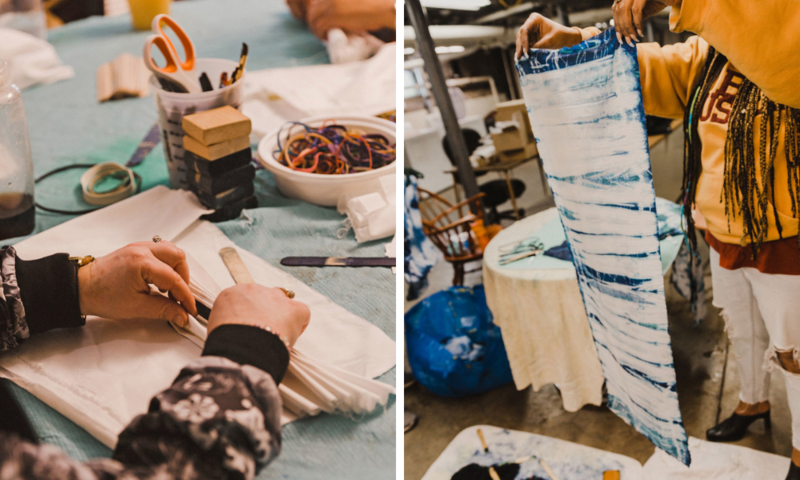 My background is as a textile artist and one my favorite processes is shibori fabric dyeing. 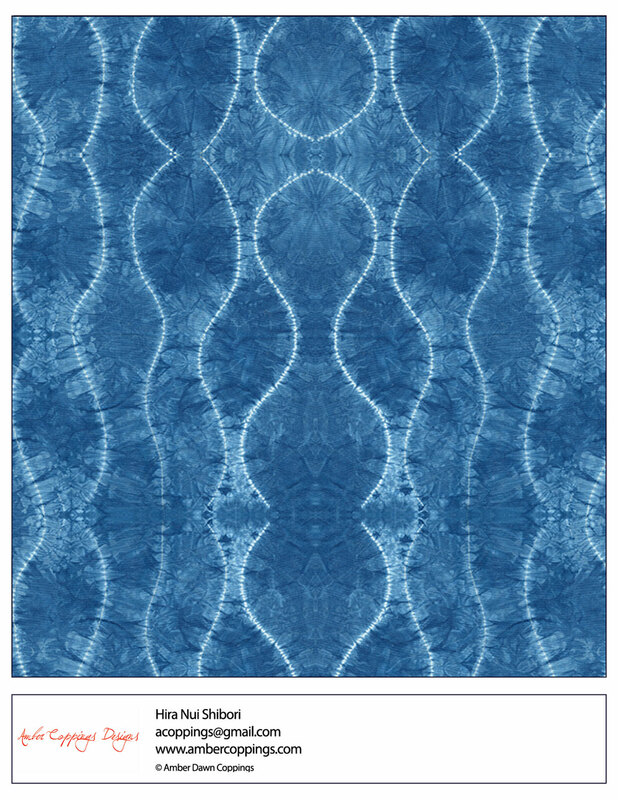 I have been practicing shibori for 16 years and had the privilege of studying shibori in Japan in 2005. It really changed my life and how I interact with fabric and art. Since this is something so special to me, I wanted to be sure to bring this to the POWER House. It fit right in as we moved along with surface pattern design in our lessons. The main techniques that I teach in my basic shibori classes are nui shibori (stitch techniques) and itajime shibori (folded and clamped techniques). We focused on hira nui shibori using a undulating running stitch on a single layer of fabric, the traditional itajime technique of using accordion pleating and binding the fabric, or a triangle fold that can create geometric circles on the fabric. 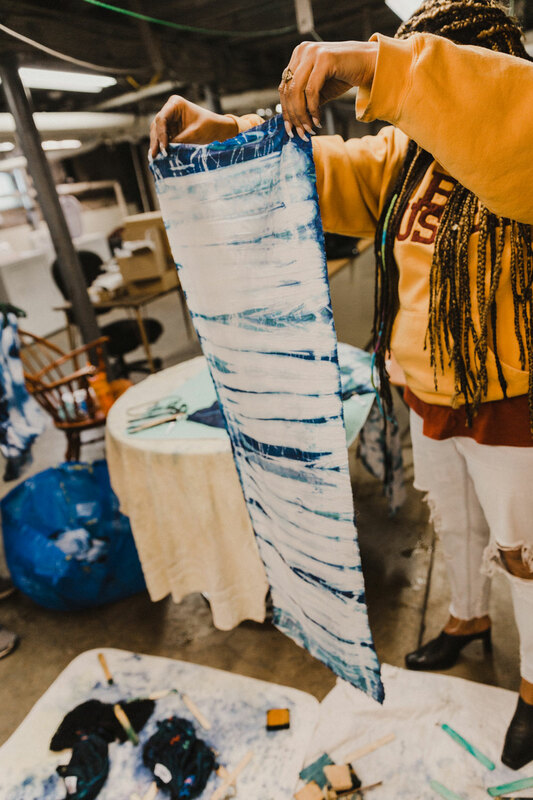 We used synthetic indigo dye that will dye fabric in as little as 6 minutes. It’s perfect for a short class! Itajime is especially successful for beginners. If you have ever folded a fan out of paper, then you can make a basic itajime design! One trick that I use is to place a popsicle stick in between all or most of the fabric layers created by accordion folding the fabric in small folds. This creates a distinct design that can look geometric, or more organic depending on exact placement and number of popsicle sticks. Traditionally, itajime is bound together using clamps which keeps the design free of extra lines. Mostly I use rubber bands in my classes which enables students to add more design and see a direct correlation of their design choices (where and how they place the rubber bands) in the final fabric. Placing the rubber bands closely together can create a wider band of resisted fabric that remains undyed. Spacing out the rubber bands and/or overlapping them can create a more tie-dye effect. Once we dyed all of our magnificent fabrics, it was time to wash, dry and iron them. Everyone was enamored with all of their samples and the finished goods such as tote bags and dish towels that we dyed. Once the oohing and aahing was over, we got out the iPads that we borrowed from the Pittsburgh Center for the Arts! 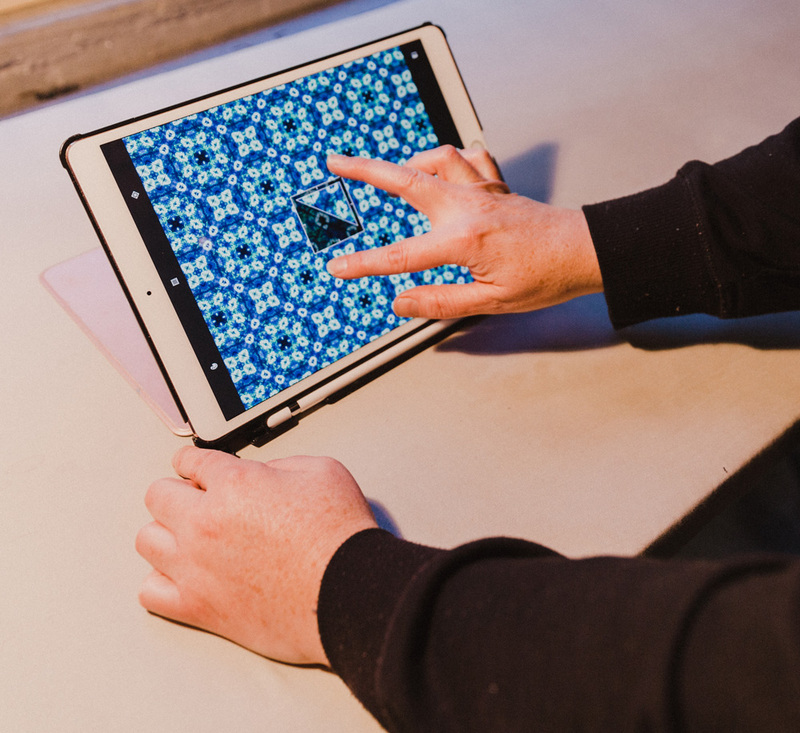 Adobe Capture CC is a fantastic app that can be used to create seamless repeats from simple patterns with motifs going in straight rows, to complex tessellations. My favorite way to use the app with students is to take photos of students’ creations from their sketchbooks, or, in POWER’s case, of our shibori samples. Once they got the hang of it, some women took photos of quickly created collages of drawings, painting, stitched fabrics, photographs, and hand-dyed fabric. One woman loved to document our process using the iPad cameras. 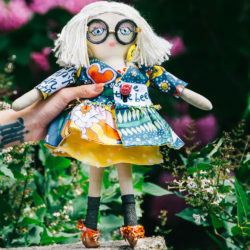 Her design was derived from a photo she took of me holding up one of her hand-dyed designs. If you look carefully you can see the bricks, green grass, and indigo blue dye in her final pattern. Once we took a few classes to perfect our designs, we sent them off to Spoonflower to print on Kona Cotton. Most of the women were absolute beginners on a sewing machine and the fabric was really easy to work with. We spent time creating simple quilt squares before getting to work on the final portion of our project- sewing pillows! Everyone sewed at least one pillow, while others sewed a multitude. Since one of our goals is to give back to our community in some way, the POWER women decided to donate some of their pillows to the POWER Collection to sell. Product descriptions were written by the women who designed the fabric and/or sewed the pillows. There is a little story in each description that can give insight into the creative process of each woman. All proceeds go to POWER’s art program so that future women in the House can continue to offer art classes. Thanks SO much for Spoonflower for sponsoring the POWER Artist-in-Residence 2018! We are all forever grateful. Amber isn’t the only one who’s caught the shibori bug. 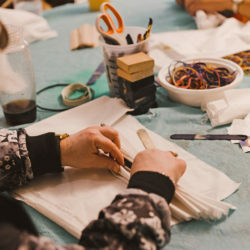 See how designer The Playful Crow has added shibori to her Spoonflower shop and be sure to stay tuned for the last post (all about being a teaching artist) in Amber’s 3-part series.